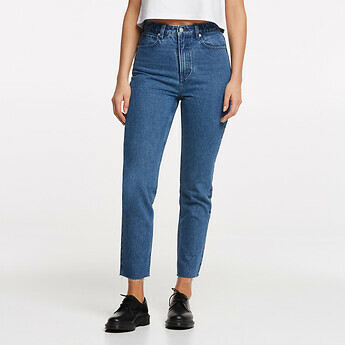 Our High Moms in Firestone Blue are the perfect 90s inspired mom fit. Sitting high on the waist, they feature a relaxed tapered leg and cropped ankle. Finished in a salt and pepper vintage blue wash with a rigid fabrication they also feature a rolled hem, dark silver trims and and tonal Lee embroidery on the back pocket.